Driven partly by the so-called “Trump Bump,” paid subscriptions to online news publishers appear to be growing in many markets worldwide, according to the 2018 edition of the Reuters Institute’s Digital News Report. 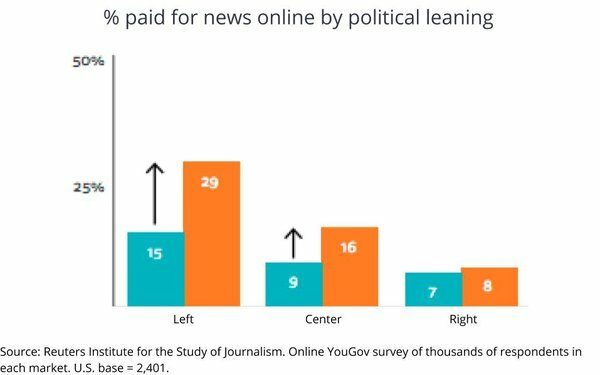 The report, which is based on thousands of surveys conducted online in each market by YouGov, analyzes efforts to persuade consumers to pay directly for online news via subscriptions, membership, donations, as well as per-article payment models. The percentage of Americans saying they have paid for online news in the past year, remains among the highest of the markets surveyed -- 16% -- but is unchanged from Reuters 2016 report. “The main beneficiaries of the U.S. surge in subscriptions since 2016 have been liberal newspapers like The New York Times and The Washington Post,” the report finds. The Times has increased digital subscription revenues by almost 50% in the last year as it heads for a target of 10 million subscribers globally. The Washington Post does not give official numbers but an internal memo revealed digital-only subscribers had reached more than 1 million, doubling in the last year.